You can sort your Event video to quickly find any frame range you’ve tagged with specific keywords. To open the Keyword Filtering pane, click the Keyword Filter button. If you don’t see the Keyword Filter button, you need to turn on Advanced Tools. Select the “Filter by Keyword” checkbox at the top of the pane. Select the keywords you want to use to “filter” the video by clicking the right side of the button next to a keyword so that it turns green. To deselect a keyword, click again. 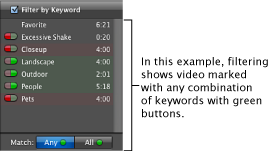 To exclude video tagged with any keyword, click the left side of the button so that it turns red. Any video tagged with that keyword is hidden from view. To show the video again, click the button again. Any: Finds any video tagged with one or more of the keywords you’ve selected. All: Finds only the video tagged with the combination of keywords you’ve selected. To see all video in the Event again, deselect the “Filter by Keyword” checkbox at the top of the pane. When you’re done, click the Keyword Filter button to close the Keyword Filtering pane.